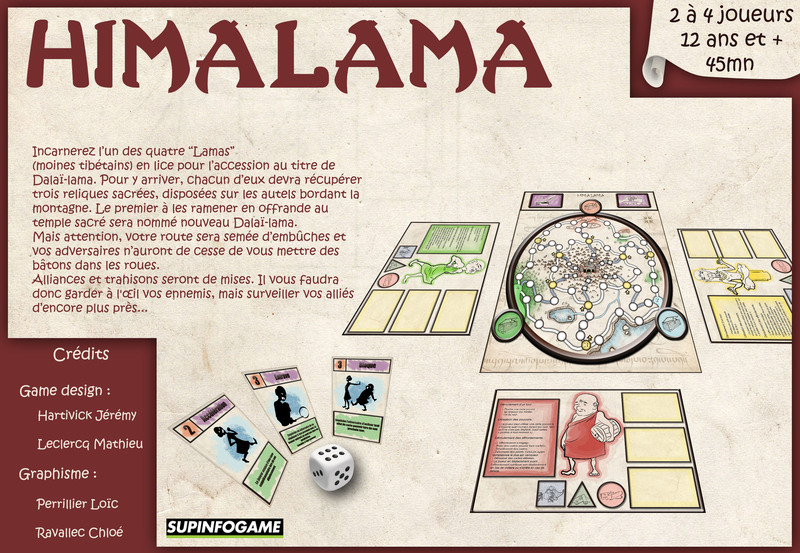 Himalama is a two to four players pick-up and deliver* board game made in 2011 during my first year at Supinfogame and based on the principle of coopetition. Coopetition is a concept in which players need to help each other in order to win, but there can only be one winner, which motivates players pushing and tricking each other and. Thus, psychology and communication are a central point of the gameplay. In this game, each player embodies one of the 4 Tibetan monks who compete to be the next Dalaï-Lama. To succeed in their quest, they have to bring 3 divine relics to the top of the Himalaya. But they must be careful, since the mountain is full of dangers such as the Yeti or avalanches and players won’t hesitate to annoy each other. Our main inspiration for this game was Munchkin, which is essentially based on this same principle of coopetition. *Pick-up and deliver: A board game genre where the main gameplay mechanic is to bring some objects from point A to point B.
I worked on this project as Manager and Game Designer. Mathieu Leclercq worked with me as Game Designer, with both Chloé Ravallec and Loïc Perillier as Game Artists.